The last installment in the first set of Fallout 4 DLC is upon us, marking the end of Bethesda’s previously-planned downloadable content and leading into the additional chapters announced with the increased Season Pass price at the beginning of March. So how do they stack up? Are they worth your time and hard-earned cash? Before you buy, take these points into consideration. The first of the three pieces of DLC to be released for Fallout 4, Automatron was a bit of a hot mess. It bizarrely featured the “return” of The Mechanist, who turned out to be completely unrelated to the wannabe hero of Canterbury Commons in Fallout 3, either ignoring established canon or asking the player to believe that two people independently of one another were so inspired by the old radio play hero that they went to the trouble of recreating his suit so they could play superhero and “save” the wasteland. Yeah, I’m not buying it. Additionally, the questline was obscenely short and ends abruptly, offering little sense of progressive narration or satisfaction. Yes, the robots are fun to make, and unleashing an army of them on enemies or setting them to work on your settlements is handy. But is it enough to justify the price? Not in my opinion. Even with the new companion Ada, the entire DLC seems rushed and almost stripped bare of substance. At $5, this is a much better DLC…that is, if you’re into building settlements. If you’re not, you’ll find it of no use. In terms of content it also seems a bit skimpy. The most notable inclusions are the neon lettering, gardening plots, a giant fusion generator, and the arena items—which are useless if you have no interest in staging fights. It’s fun to pit waves of robots against each other (using the Robot Workshop from Automatron) but good luck navigating the new concrete stadium items, which come with few instructions and sometimes require elaborate and well-planned wiring systems. 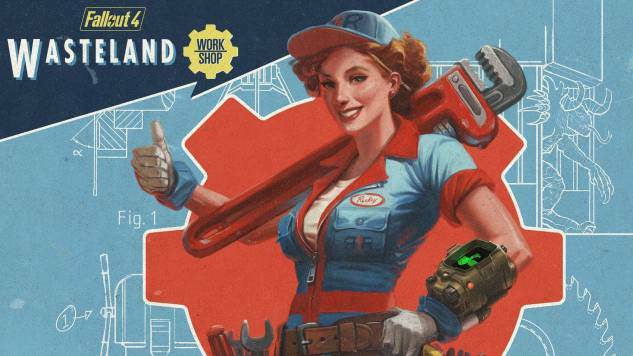 For some reason, update 1.4, released just before Automatron, added a big batch of items to the settlement workshops, which doesn’t make sense given that Wasteland Workshop was just around the corner. While it was nice to get those settlement pieces for free, it doesn’t ease the sting of Wasteland Workshop’s stripped feeling. It’s cheap, which does help reduce the sense of buyer’s remorse, but for old Fallout fans this DLC will be useless. For new fans, it will seem incomplete. You can’t just turn a game into a soft city-builder with Sims elements and not give players more decor options. And there are still assets within the game that have for whatever reason not been reused for settlement building, which seems like a major missed opportunity. I give this one a C+. If you enjoyed the Point Lookout DLC of Fallout 3, you’ll probably like Far Harbor. It injects some much needed visual variety into the game by setting the chapter in Maine, adding foreboding fog and storms to the weather system. It also has more of a full story arc, as opposed to the brief one-mission path of Automatron, or Wasteland Workshop, which has no missions at all. Personally I’m at the point in my Fallout 4 file where I’m no longer scavenging for scrap for my settlements and gun and armor mods, so I’ve had time to comb and creep through each new location carefully, as with the two previous Fallout games. Being on the constant lookout for parts kind of ruined the base Fallout 4 game for me; the Pandora’s Box-like elements of forbidden exploration were completely lost. I’m feeling a bit of that old magic again as I explore Far Harbor. Somehow, like the base game, Far Harbor still comes across as something very much written and put together by the same folks who worked on Skyrim: meaningless “help the villagers” fetch-quests and location clearing missions, the kind of stuff that (along with the randomly generated weapon and armor modifiers and disappointing Unique bonuses) makes the game feel like it’s losing grip on the series’ identity. Nonetheless its return to story-based DLC gives me hope about any future installations. In my book, Far Harbor gets a B+. Holly Green is a reporter, editor, and semiprofessional photographer living in Seattle, WA. She is also the author of Fry Scores: An Unofficial Guide To Video Game Grub. You can find her work at Gameranx, Polygon, Unwinnable, and other videogame news publications.